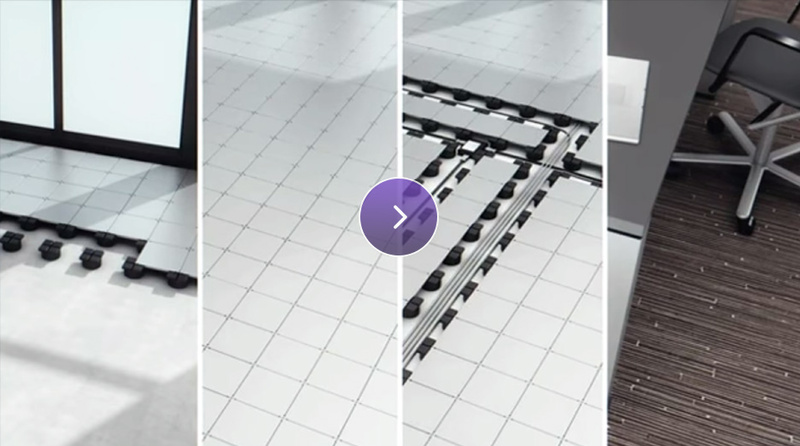 Legrand’s Soluflex is an innovative low-level flooring system engineered for quick installation and easy reconfiguration. It offers maximum freedom and flexibility when designing workplaces. Forget traditional, fixed office floors. Forget cutting and breaking. Forget gluing, setting and screwing. There are numerous possibilities – from renovating floors in old premises to large floor spans in modern new-build offices. The cable floor system can be covered with any type of covering as carpet tiles, rubber, stone or wood. Furthermore, if the office relocates, the supports and tiles can be taken along and re-used in a new office. The Soluflex floor is available in four different heights (37, 60, 90, and 120 mm) so the system is ideally suited to all types of projects (renovation and new development). People seldom associate a floor with freedom, but the Soluflex cable floor system offers both designer and user the utmost freedom. Freedom in design because everything is possible – whether it’s the facility manager, technical services or the end user who occupy a perfectly connected office. Managers of office buildings can achieve considerable cost savings when companies relocate, but on top of this, workplace connections can be achieved within a short time, without power cuts or data network disconnections. Modifications to workplaces can easily be carried out by the end user himself, during working hours. The way in which offices are arranged will no longer be determined by how the cables are installed. Soluflex is made of 225 x 255mm metal tiles, mounted on polypropylene supports. Underneath there is ample room for cabling, meaning the end to trailing cables. Carpet tiles and other floor finishes make it complete and give unlimited freedom when designing workplaces. You do not have to be a floor expert to install Soluflex. It is merely a question of placing supports in a row and clicking tiles into them. “Without glue or screws”. The required cabling and connections can be installed between the supports by removing a few tiles and click them back. Soluflex offers considerable time-saving as floors and cables can be installed virtually simultaneously. Soluflex can be integrated with a wide range of power, data and Audio-Video accessories that are ideal for the changing needs of today’s offices and commercial installations.